As a mom, it’s normal to feel like you are always getting food ready for your kids . . . breakfast, lunch, snacks, snacks, snacks, dinner, and more snacks. I feel the same way. And with all of that food preparation, I found it difficult for me to make my own meals and snacks throughout the day since my little food monster demands so much. This is why I have to plan my “mom snacks” in advance that are quick and easy to make that also satisfy my cravings. 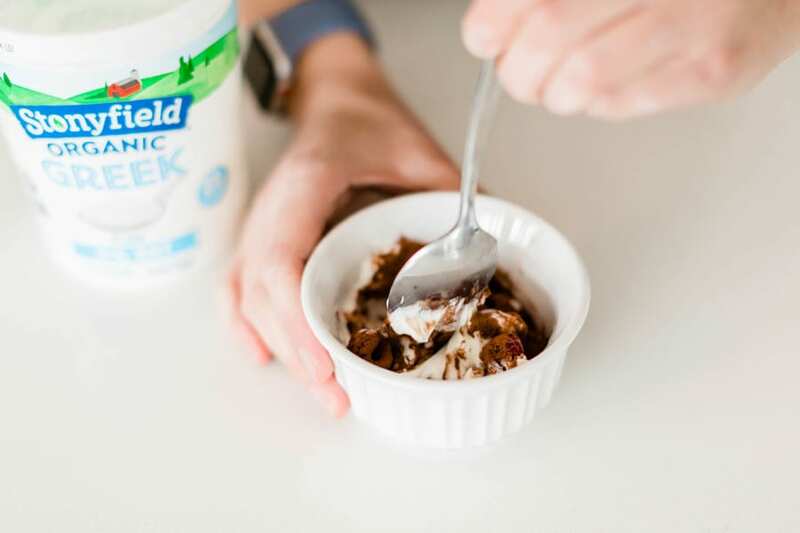 Lately I’ve been incorporating more Greek yogurt into my meals and snacks since Greek yogurt is rich in protein (building muscle, reducing hunger & boosting metabolism), calcium (improving bone health), and contains live and active cultures (good for the tummy). 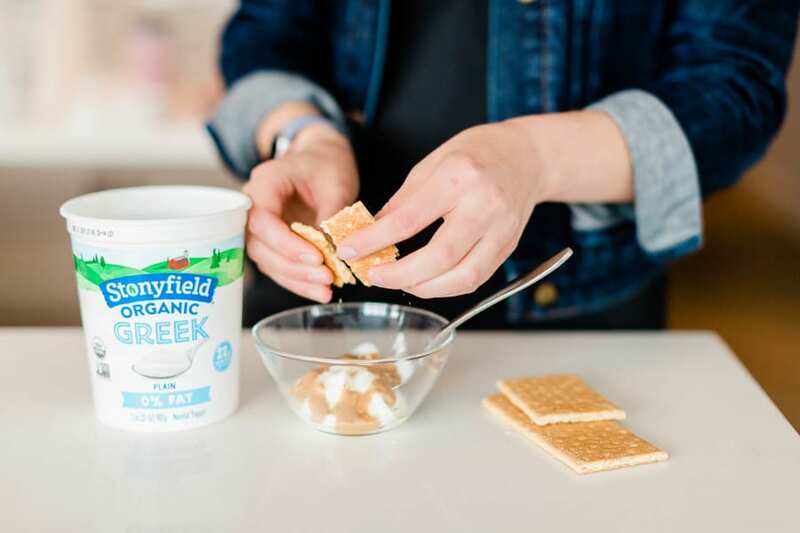 My go-to yogurt for my family and myself is Stonyfield Organic. 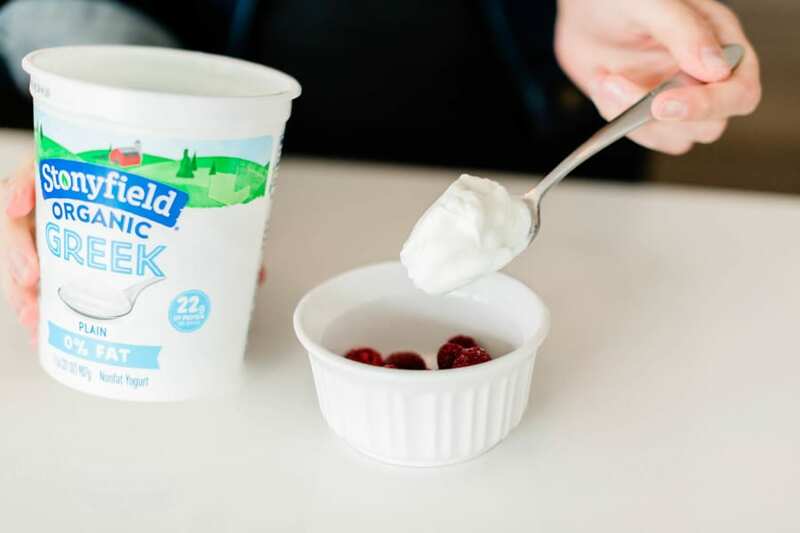 They make their yogurts without the use of toxic persistent pesticides, artificial hormones, antibiotics or GMOs. 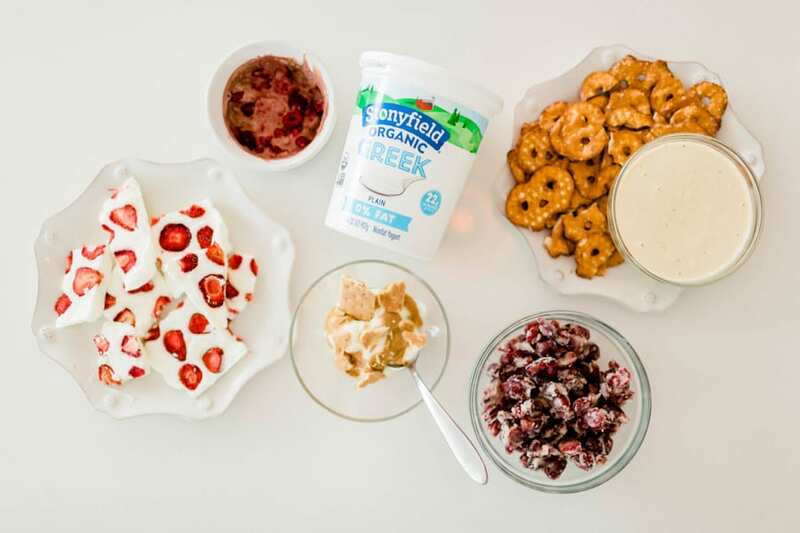 And–to put it simply–their yogurts are creamy and delicious! You’ll always find some of their products in our fridge. I am in love with peanut butter! 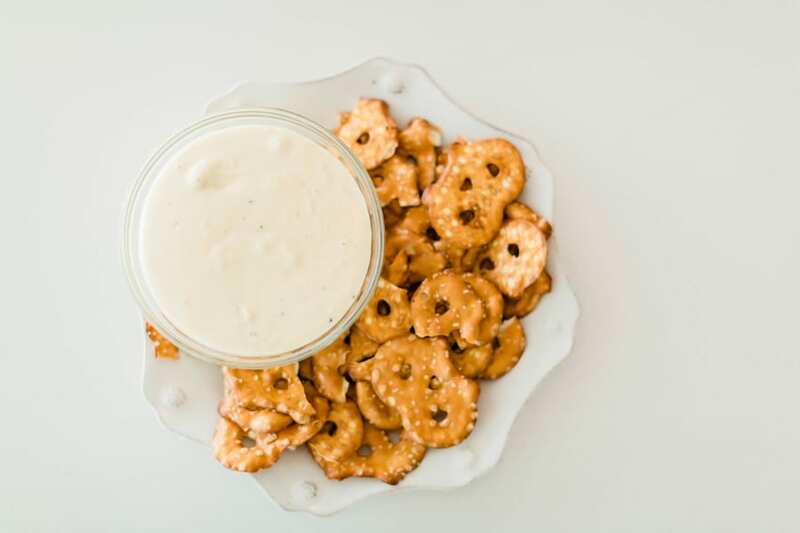 This snack is crazy good especially if you are craving something that’s filling, creamy, and that has a good crunch. 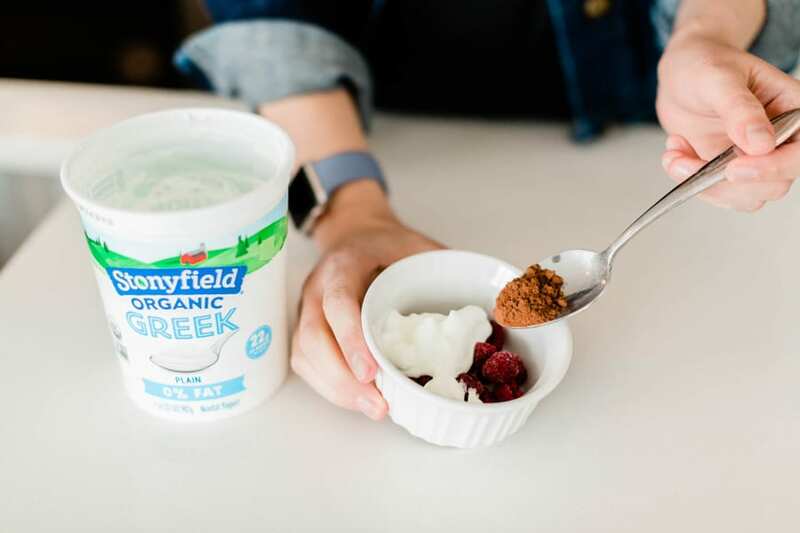 Scoop some yummy Stonyfield Greek yogurt into a bowl. Warm up three spoonfuls of peanut butter in the microwave in a separate bowl. This will make it soft and pourable. 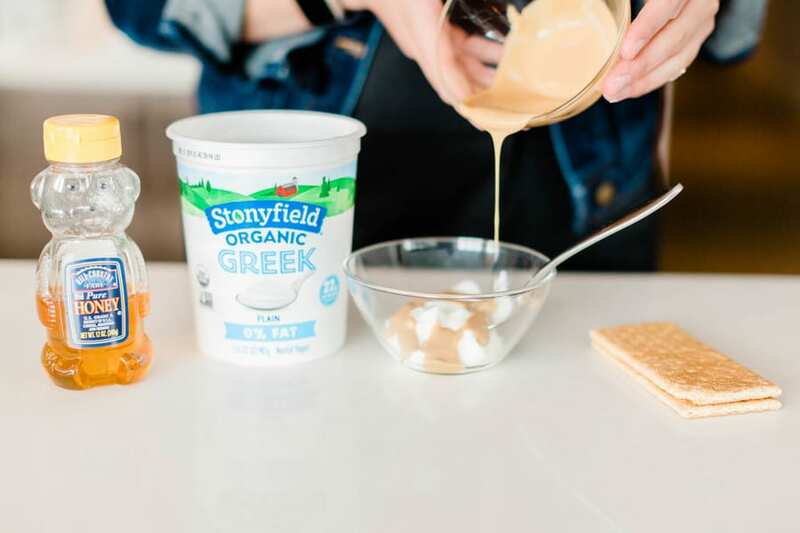 Stir in the peanut butter in the Greek yogurt. 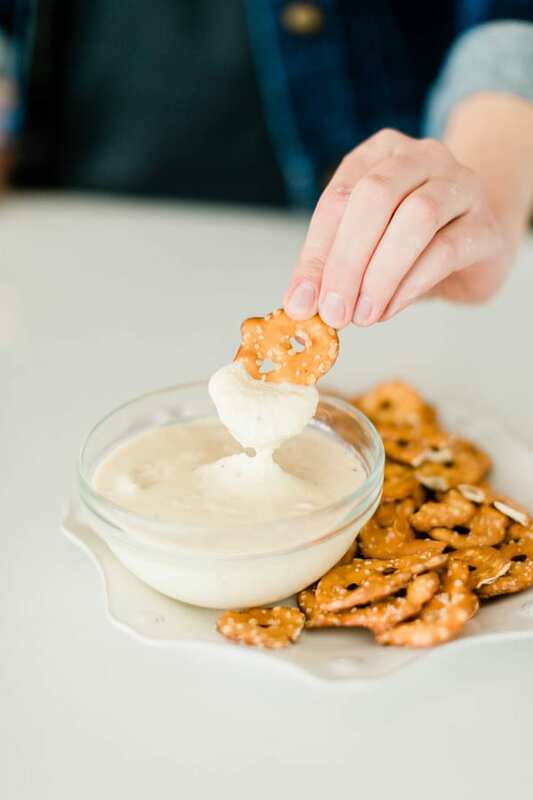 Top it off with something crunchy and sweet! I added a little drizzle of honey and crumbled up some organic graham crackers. It’s nice to be able to prepare some snacks after my son has been put to bed so that I have ready-to-go bites with me for the next day that I can easily throw in my bag. This is one of those recipes. 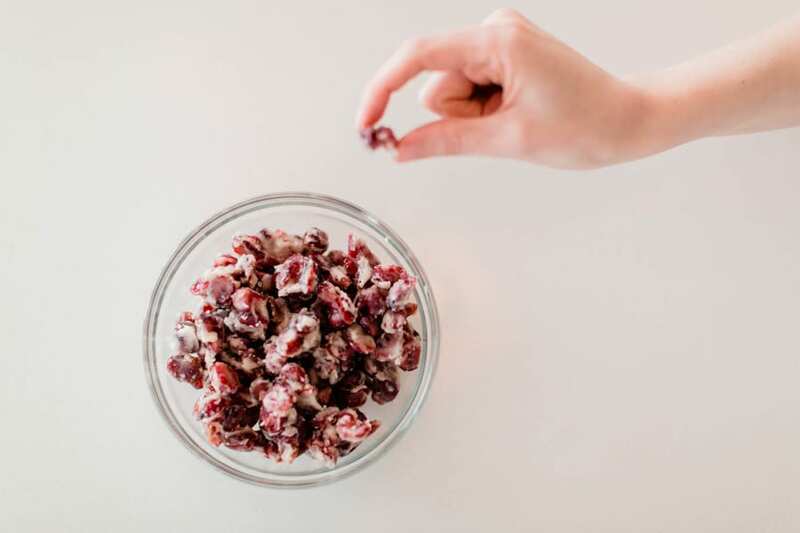 🙂 These yogurt-covered cranberries always give me that kick of energy that I need! *Warning: this yogurt-coating has a lot of sugar. But so do a lot of commercially-made yogurt-covered snacks. At least this homemade treat is made without oils, emulsifiers, and stabilizers, so that makes me feel better. Add the gelatin into the yogurt mixture and whisk together until the gelatin is completely dissolved. Scrape the yogurt mixture into a small mixing bowl and then pour the powdered sugar on top. Begin mixing gently until they combine into a thick, but pourable, frosting. 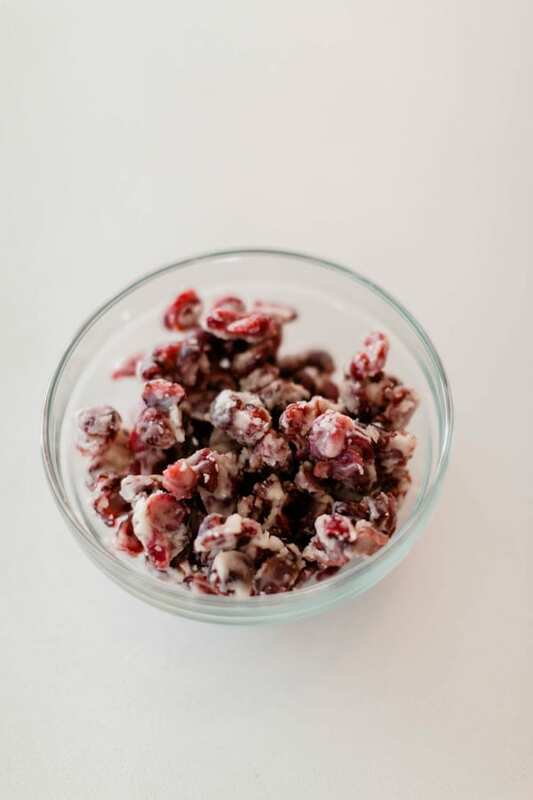 In another mixing bowl, add the cranberries with a tablespoon of powered sugar until they are coated. Pour half of the yogurt coating over the cranberries, and stir until they are completely covered and there is no more dry powered sugar. 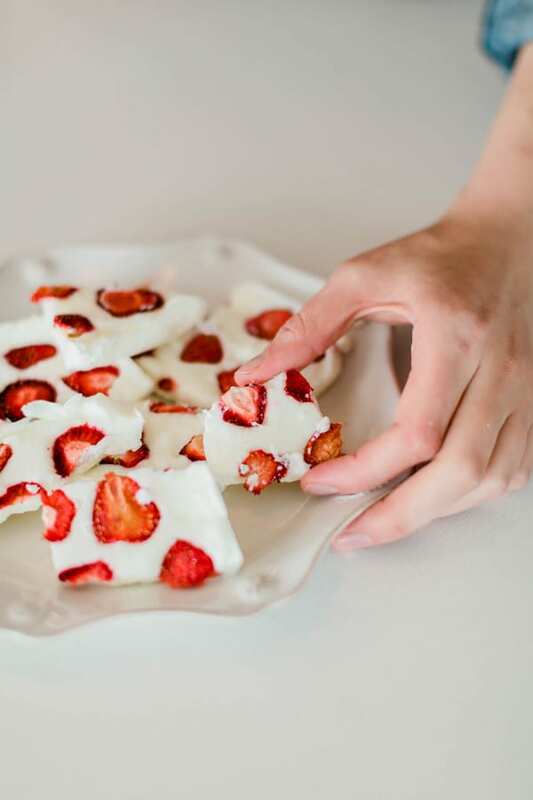 The previous recipe took a little time, but this snack recipe is done in minutes! It also includes cocoa, and that chocolate-y flavor always hits the spot for my nighttime snack. Grab a ramekin or small bowl and drop in a few frozen raspberries. 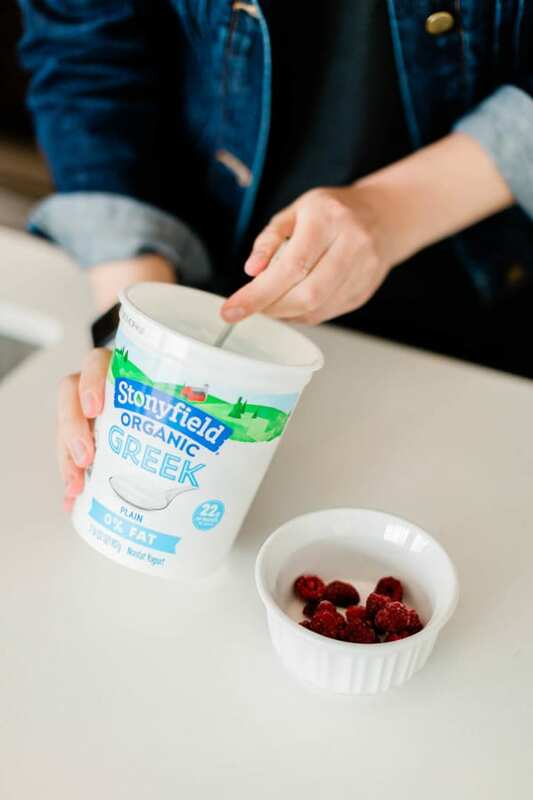 Scoop in one serving or a couple of scoops of Stonyfield Greek yogurt from your quartz container into your bowl. Add one teaspoon of cocoa powder on top and slowly mix together. Drizzle some honey on top and enjoy! If you want a snack that is more savory than sweet, this homemade hummus will do the trick. Pour the garbanzo beans into your blender or food processor. 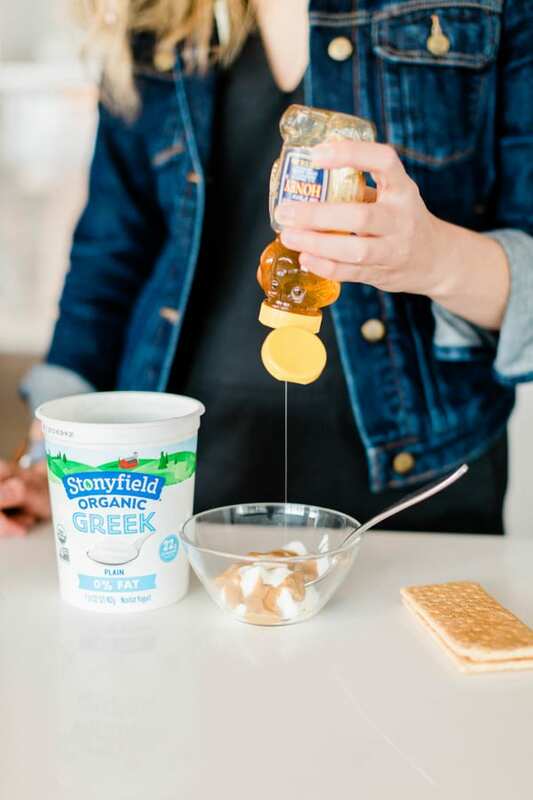 Then add the Stonyfield Greek yogurt, the lemon juice from your 1 lemon, the olive oil, garlic, salt and pepper. Blend until smooth! Now this is the easy recipe of them all! It’s so easy that your kids can even help make it with you. And I’m not gonna lie, this is a great snack for them as well. They will think that they are getting dessert when really this is a very healthy snack! Here’s what you need and how you make it. Put the pan in your freezer for a few hours until the yogurt is completely frozen. (Mine took about 6 hours.) Once frozen, remove frozen yogurt from the pan and peel off the parchment paper. 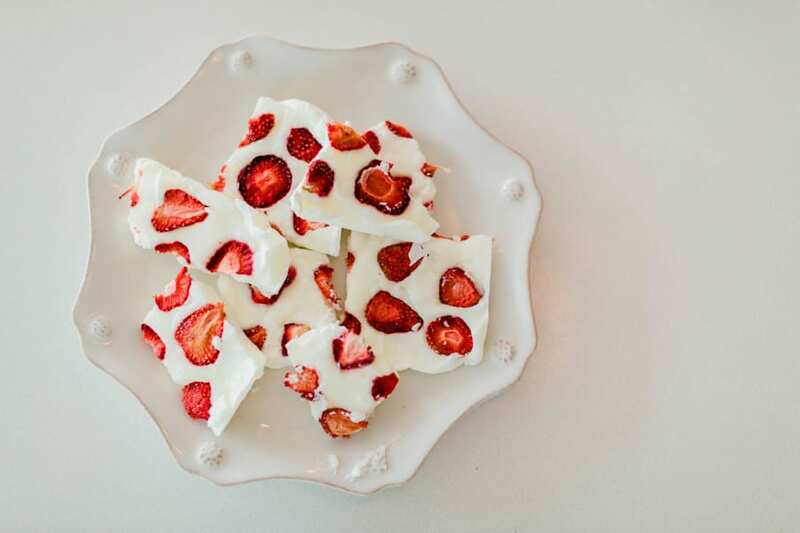 Break your strawberry yogurt bark into pieces and enjoy!